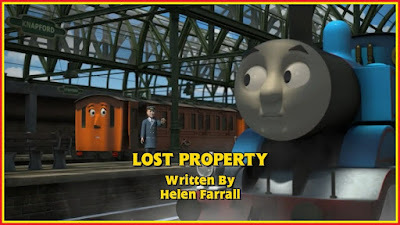 It's time to look for some Lost Property in today's episode! So we have a new writer and another episode where Thomas is the focus? And it's also a very railway-centric episode. An interesting combination, but how will it fare? In a word? Brilliantly. If there's one type of episode I really like, it's those that have railway operations at the forefront. This is no exception, only here it goes slightly beyond. It's basically the quintessential Thomas & Friends episode: engine does a job, things go wrong, engine proves themselves. It's also really entertaining and it has a lot of heart. I also like that the railway inspectors returned. It seems like this is becoming a yearly thing, like the four Christmas-themed episodes and the six direct-to-DVD episodes, and I'm all for that. It just makes a lot of sense that they'd want to visit yearly in order to ensure it's running as it should. As for the kids? While I do like how they were portrayed as it does feel real to life (although, in fairness, it is only a small minority that act this way), I think that more should have been done to give them some sort of punishment, or something to regret their behaviour. Having the Fat Controller try and defend them really didn't sit well with me, especially since that also happens in reality, only it's the parents that are the ones on the defensive. I know he was only trying to keep the inspectors happy, but wouldn't him at least giving them a talking to have shown the inspectors that he was really in charge? That said, the ending in itself was quite nice. Giving the whole railway a "glowing report" did seem like a bit of an overreaction just for returning a watch, but it was made clear that it meant quite a lot to the inspector. If they'd have said that he'd give the Ffarquhar branch a glowing report, or just Thomas, Annie and Clarabel, it would have made more sense. That said, if the episode had just been a regular story about the railway being inspected, I don't think I'd have liked it too much as it runs the risk of being rather boring (and, like I've said, we've been down this road before). However, they threw in quite a bit of humour throughout. Some of it visual, some physical, but pretty much everything hits the mark for me. It really helped to keep the investment up. As usual, the animation is amazing. The scenery around the branch line is absolutely gorgeous, and I like how it's being treated as an actual branch line, rather than throwing random assets together and calling it a "branch line". Also, the glossy look of the models really shone here, especially in this shot. No detail is left out of the reflection and it just looks... lovely. And, as usual, the voice acting is excellent. John Hasler seems to be getting better and better as Thomas; it's like he's been voicing the character for years, he feels that natural. That said, Teresa Gallagher (Annie and Clarabel) and Keith Wickham (The Fat Controller) did an excellent job as well. #S19Property - proof realism isn't always required to make premium children's entertainment. Comical, well written & with great intentions. #S19Property It's a good episode, but not the best ever. #S19Property is quite charming. While it is a bit silly, it sends a good message and has a lot of heart. Good blend of realism and fun! around, then you should always return it to it's owner, whether it'd be money or an item worth of value. Those teeth actually belonged to mother. I nicked them and fitted them with a wind up mechanism. Hilarious! Oh, that inspector is a right cu...errr...cheeky sod. Saved that one. I suggested smashing the window, but the director said that was too much. Annie wasn't best pleased at the prospect either. Lucky the camera was on or I'd have given that kid a good clip round the ear. Children should be seen & not heard. And preferably not seen. Am I alone in thinking that children like the one in today's episode should be put down for the good of the nation? Stopping for a cow? Bloody hell. Just run them over for christ's sake! They are probably on their way to be slaughtered anyway! You should have seen the inspectors' faces when I told them "Next, we'll ride on Duck." They thought I was mad. I was gutted when Thomas returned that "lost" pocket watch. I was planning to sell it on eBay. Imagine how many jaffas I could've bought! "Initiative" - another rather big word. People will start to think I swallowed a whole dictionary. I only managed A - D. Very bland taste. Today's episode was my attempt to break into comedy. I'll be touring Sodor with my one-man show next year. Look out for it. @NWRMadMan Ah well, it's probably in the lost property office. In summary, today's episode was very good. About time I got a starring role! It's rather early to claim whether this is my favourite episode this series, but it's nice that there's such a great one this early on. It sets a high bar, and gets fans excited about future episodes. Sure, it's not perfect, but for a first attempt by a new writer, it's fantastic. She seems to understand the characters really well and, I think, she'll be an excellent member of the writing staff should she stay. There's not much more to say. Bring on the rest of the series!